"All of us who wish to bring forward a renewal of Christian culture in our world should begin on our knees, in prayer, but we must also begin with books in our hands formed in the great tradition of the classical mind." Properly understood, Classical Education is not only about curriculum or methodology, but recognizes a correct understanding of man and his ultimate end. Classical education aims at forming a student in wisdom and virtue. Although it is the best way to learn the skills for both employment and citizenship, it does not narrowly focus on job skills training or political indoctrination. Rather, classical education aims to pass on the culture of the Christian West to the next generation. The grade 1/2 program primarily focuses on learning the skills necessary for future learning. Homeschooling families enjoy the support and guidance in these important basics. 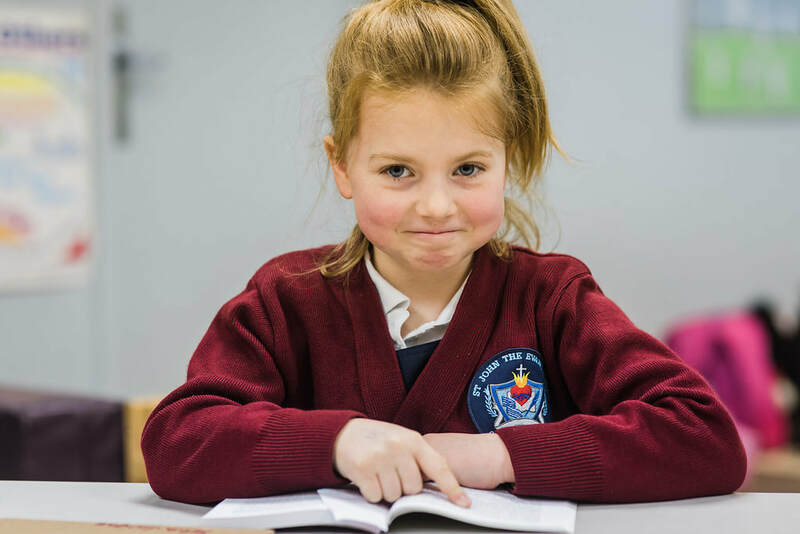 At SJCS we place a strong emphasis on learning to read well, the proper formation of letters for both manuscript (printing) as well as cursive writing, spelling, and the beginnings of written expression. Through daily recitation, the children are exposed to the Catholic faith, beautiful poetry and, in the third trimester, a gentle introduction to basics of grammar and Latin. easily managed at home on carry-over days: Parents follow the homework page, as well as work with their homeschool facilitator to choose their own math and science resources to cover. Little Lamb Choir and Phys Ed classes to supplement the core curriculum. Having acquired the basic tools of reading and handwriting, the grade 3-6 classes have more formal studies at SJCS. Following a two-year cycle , they are introduced to the great ideas in history, literature, religion and science. At SJCS we place a strong emphasis on beautiful handwriting, character formation and music. Through daily recitation, the children are exposed to the Catholic faith, beautiful poetry, geography, grammar and latin. Homeschooling families have found the Schola to be a wonderful support to their studies at home. We study art, memorize poetry, and learn the rules of grammar and of written composition. Public speaking and social etiquette are practiced in class discussions, drama presentations, and poetry recitation. We delve into the worthy content of fables, myths, good books, and scripture. We learn about history as a great story and about what makes a character good and noble. SJCS students study math at home along with other subjects that might interest the student. A homeschool facilitator helps families attain their learning objectives. Our two-day program is carefully organized to offer children a solid foundation in skills and knowledge leading to our four-day program. In other words, what is taught in early years is further developed in later grades. Our four-day program, operating on Tuesdays through Fridays, is for students in grades 7-12. This program supports the homeschooling family by building upon the strong foundation developed in the lower grades. We study mathematics, logic, science, history, art, literature, theology, Latin or Spanish, and physical education. We become involved in Socratic-style discussion focusing on carefully chosen works of great literature – from translated works of ancient Greece and Rome to the great works of English classics. An interdisciplinary composition course offers instruction on essay writing and the art of persuasive speech. Grade 10-12 students, working with their homeschool facilitator may earn High School credits by completing many of our courses. This can be an excellent way to meet the requirements of the Alberta High School diploma. ​ We are growing an extensive library for the junior program. It includes historic novels, classic literature, and picture books relating to various themes being studied - history, art, literature, science. Books are selected according to a unit of study and placed in a "moveable" library which is wheeled into the junior classes every week. Junior students are encouraged to sign out a book or two to foster a love of reading and to supplement the history-literature class.